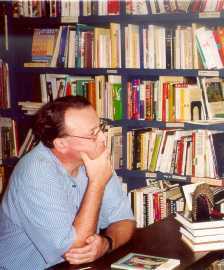 Richard Lyons is the author of three books of poetry, Fleur Carnivore (The Word Works 2006), Hours of the Cardinal (University of South Carolina Press 2000), and These Modern Nights (University of Missouri Press 1988). A former winner of the Peter I.B. Lavan Younger Poets Award from the Academy of American Poets, Richard Lyons received a B.A. from the University of Massachusetts, an M.F.A. from the University of Arizona, and a Ph.D. from the University of Houston. He has published poems in numerous journals among them The Nation, Poetry, The New Republic, The Paris Review, and The North American Review. In 1988, Deborah Digges selected his first collection These Modern Nights (to order e-mail rjl@ra.msstate.edu) as a Devins Award winner in the University of Missouri Press Breakthrough Series. In 2000, Richard Howard selected his second collection Hours of the Cardinal (available at www.sc.edu/uscpress) for the James Dickey Contemporary Poets Series at the University of South Carolina Press. His latest collection Fleur Carnivore won the 2005 Washington Prize.